November had us all discombobulated between National Novel Writing Month, being afflicted by the worst head cold and sinus infection (that may have been just me), and holiday preparations and celebrations that December almost looks like more of the same with wrapping up semester work for teaching, and more holiday preparations and celebrations. I’m thinking that we shall have to revisit Dracula again later down the road since, to be quite honest, I never got around to finishing it, what with being on my death bed and all. As for this month we are revisiting Grave Expectations by one of our favorite literary mash-up artists Sherri Browning Erwin. 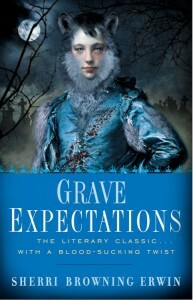 She brings death to Dickens’ Great Expectations with a mayhem twist of darkness. And if that isn’t enough of a wonderful thing a copy of this book, autographed by the author, is one of SEVEN books in our end of year giveaway pack! Keep a look out as we will begin the giveaway next week for those with a US mailing address. Our sincerest apologies for not being able to open it up to our amazing international readers. We appreciate your participation in discussions and hope you continue to read with us. While we realize that not everyone celebrates Christmas, we are confident that Miss Austen did, and don’t forget her birthday December 16. So in honor of that we hope you have some special holiday plans this month that include fabulous feasting and time with loved ones. What are you planning this holiday season? Any special traditions? And what reading selections would you like to read in 2014?